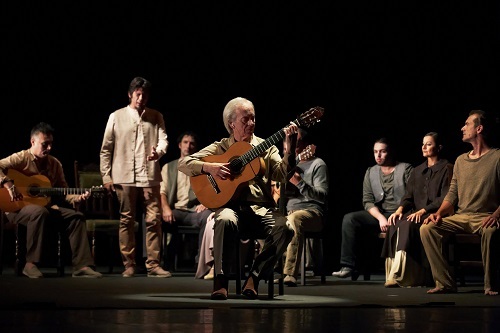 The legendary flamenco guitarist Paco Peña returned to Sadler’s Wells with Patrias, a show that explores through music and song the considerable impact of the Spanish Civil War on his country’s history. Patrias is inspired by one its most famous casualties of the war, the poet, artist, playwright and musician Federico Garcia Lorca. The evening began with a short tribute to Federico García Lorca with Paco Peña sitting centre stage with guitar held high before he launches into a solo that immediately illustrates why he is given such legendary status. Peña manages to encapsulate all the passion and technique of the flamenco guitar and make it seem effortless. He is then joined by the main male dancer, Angel Muñoz and we see another side of Peña. Both dancer and guitarist join as one to create a remarkable rapport in which the charismatic Muñoz is driven to greater heights by Peña’s remarkable talent. Finally, the main female dancer Mayte Bajo brings a classical aspect to her piece whilst keeping within the flamenco spirit. Whilst the audience was surprised by the abrupt end to the first half, there was much appreciation for the exceptional talent on view. The main work Patrias followed after the interval and we are introduced to the rest of the musicians, singers and dancers. 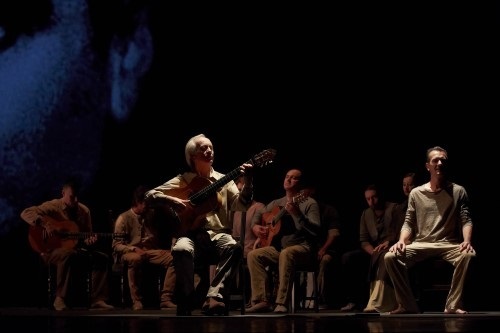 The whole ensemble with the help of dramatic footage on the back of a sparse stage tell the story of the Spanish civil war including music, speeches and songs from both sides interweaving with energetic dancing from Muñoz ,Bajo and the rest of the group. The focus of the story is Lorca who met his untimely death by firing squad at the beginning of the war in 1936. 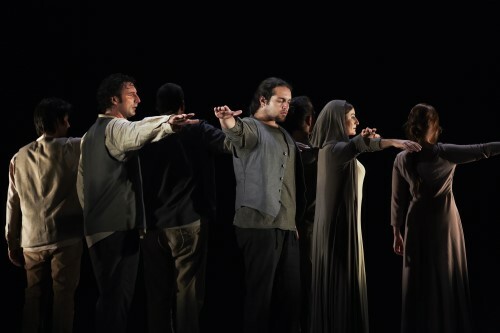 Using many of Lorca’s own words the descent into the tragedy of the war are articulated by the extraordinary singing of José Angel Carmona and Gema Jiménez. Peña is joined by fellow guitarists Paco Arriaga and Rafael Montilla on guitar, Nacho López and José Manuel Ramons ‘Oruco’ on percussion, and powerful narrator Jorge de Juan. Although there are solos and duets from the ensemble, for most of the show the cast often act as performer and spectator, sometimes reacting to the footage shown with considerable passion and emotion. Patrias (means homelands) and the show provides some insight into a conflict that divided Spain into two factions that would have serious consequences for latter developments. Even now memories of the war are often shrouded in bitterness within Spain especially certain regions that suffered more than others. The words of Antonio Machado about how The Crime Occurred In Granada is displayed to make the point that Lorca, a son of Granada and Andalusia was murdered in his beloved ‘homeland’. In many ways this show is very different from most flamenco shows, its subject matter raises it to another level. There are still the familiar themes of passion, emotion and power, however these are themes within a greater drama that is still ongoing. 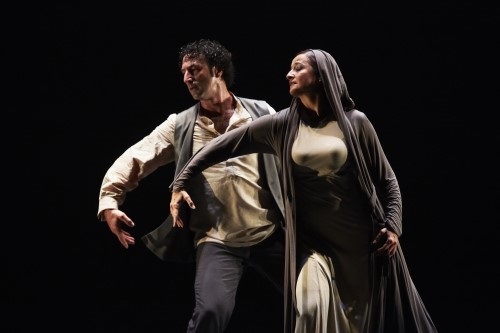 The incredible talent of Paco Peña and his remarkable ensemble manage to explore Spain’s past and present with an intelligence and flair that was much appreciated by the Sadler’s Wells audience. By londonvisitors2014 in London Dance on July 13, 2016 .